In this section, I have included projects that I worked on as a part of a collegiate team at SUNY IT. The MSNEd curriculum development project was developed during the Curriculum Design course. The Safe Staffing for Quality Care Act paper was completed in the Advanced Nursing, Health Policy & the Health System course. The project was aimed to raise awareness for the need for safe nurse staffing to ensure quality patient care. A group member and myself presented our position to Senator Griffo. The brochure was presented to the Senator during our meeting. 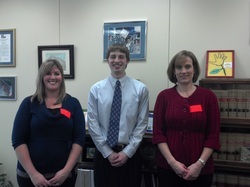 The meeting was a success; he assured us he would advocate for the Safe Staffing for Quality Care Act. I have also included a list of professional committees that I currently work on as an active member.